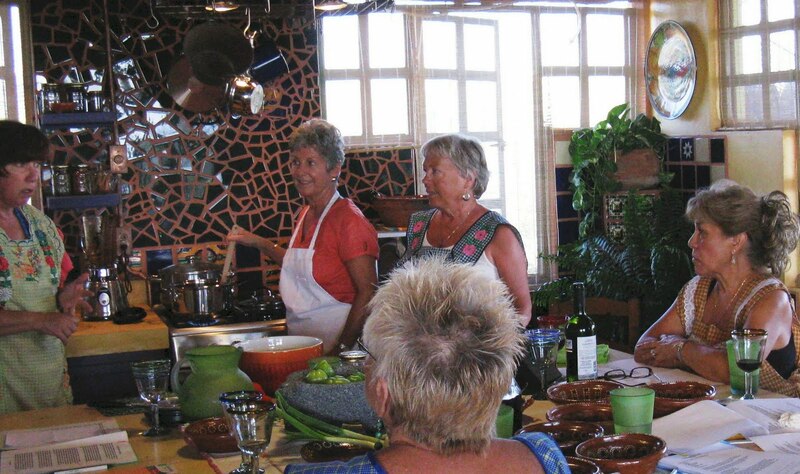 Here we are… cooking up a storm! This is a Mexican Basics class, starting with salsas and winding up with Mexico’s national dessert — velvety smooth caramelized flan. Everyone pitches in, roasting and peeling peppers, tomatillos, garlic and spices and grinding fresh salsas in a molcajete — the Aztec volcanic stone equivalent of a blender. Cabo doesn’t have the great traditional markets of, say, Oaxaca or Merida. The good news is, more and more the mainland of Mexico is coming to us, and we can find more of the traditional ingredients to make Mexican specialties really special. For example, we now have a couple of old fashioned tortillerias, with the ladies grinding fresh nixtamal in big grinders brought from Central Mexico, pressing each tortilla by hand and cooking them up in the middle of the funky palapa topped workspace on a big round comal heated to just the right temperature by a special giant gas burner. It’s worth the trip to buy fresh ground masa, still warm, to make light, spongy tamales and masa antojitos. I love private classes because we can do a little culinary tour of the area including tortillerias, carnita makers to rival anything found in Michoacan, and markets that cater to Mexican cooks where you can pick up special chiles, spices and other goodies to take home. Speaking of cooking–I’d better get cooking right now. Muchos saludos to all from Cabo, and of course, ¡buen provecho!